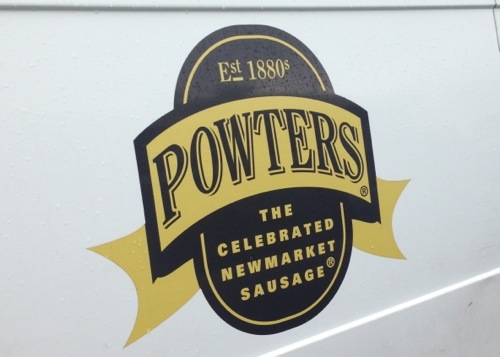 Back in the summer I was fortunate to have the chance to go and visit the Powters sausage factory which is very near Newmarket. I was incredibly impressed with the standards in the factory. It was slick but very much focused around traditional techniques and methods. 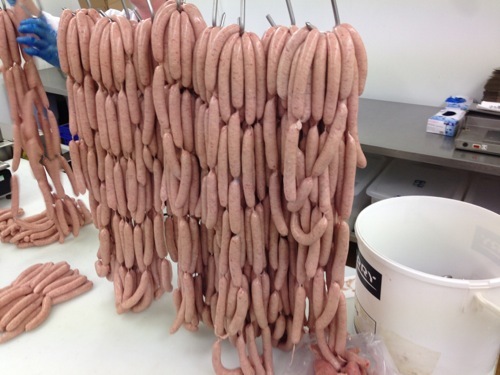 Powters have a great team working behind the scenes to bring you some great sausage experiences. 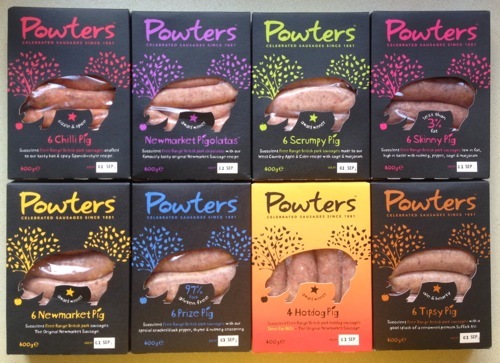 This review has been a little while coming because I’m a massive fan of Newmarket sausages and I wanted to savour all of the varieties that Powters have to offer. Originally I had planned to write about each variety as I tried it but in the end I’ve had a plump for a summary of what’s on offer. I will, shortly, take you on a whistle stop tour of the standard Powters range, not that there is anything standard about it! But first let me tell you about something completely exclusive to the Powters Rocket that resides at Newmarket Racecourse. This is a sausage which is made by Powters and only served at the Racecourse. 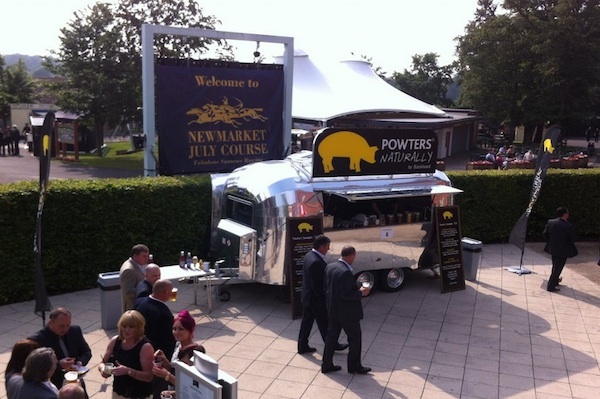 As you may know Newmarket Racecourse is getting more and more popular as a venue for events and it seems fitting that such a high quality venue would have a bespoke sausage. When it comes to describing the smokey BBQ jumbo words fail me a little. They failed Mrs P. They also failed Mrs P’s brother Tom who happened to be in the right place at the right time when we were sampling these. They are simply amazing. 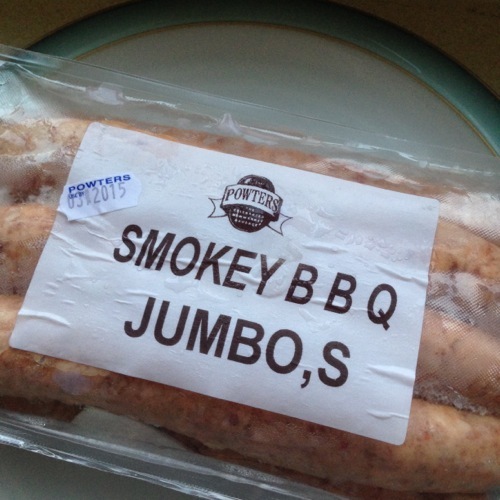 These are generous sausages, well filled and well balanced and they absolutely deliver a top smokey BBQ experience. The smoke and the BBQ don’t overwhelm the other ingredients and you can taste the quality pork. This is definitely one of the best sausages I have ever eaten. If you needed an excuse to go and watch a band at Newmarket race course then this is it! You have to try these sausages! 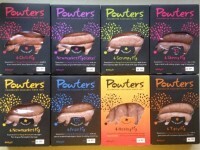 And so to the range available in a variety of supermarkets around East Anglia and from the Powters shop in Newmarket. Chilli Pig: These were very well filled with a great balance. They had a comfortable amount of heat so you were still able to enjoy the full flavour of the pork but with a warming style to them. Tipsy Pig: These had a great pepper kick with some serious well balanced sausage making skills. The ale provided a warming dimension. So often ale sausages are unbalanced or you can’t taste the ale but not the case here. Balanced and no flavour knocking out another! Scrumpy Pig: Again another great sausage which had a subtle sweet edge to it. It was definitely apple and it only served to bring out the flavour of the pork even more. Newmarket Pig: These were well filled, well balanced with a decent pork flavour. Most importantly they are a reasonably coarse sausage and I think this adds extra bit to the whole experience. They are incredibly well seasoned with a decent amount of pepper and mace. The Newmarket Pigolatas which have the same recipe in them were a really nice size and cooked really evenly. Powters have also made a hot dog version of the Newmarket Pig which is called the Hotdog Pig! These were great and cooked really evenly maximising on hot dog satisfaction all round. Prize Pig: This is another special creation. It’s the award winning Newmarket Pig mix but with some more bold seasoning choices. This has extra pepper, thyme and nutmeg and does not disappoint! It’s a bold sausage but still very well balanced. So that dieters can also get involved the clever banger boffins have also made a variety called Skinny Pig! This is clever because they have managed to reduce the fat content to less than 3% but maintained the flavour! This sausage is high in taste with nutmeg, pepper, sage and marjoram. I was very sad when we ate up our final Powters sausages from the freezer. I had tried hard to make them last but these are awesome sausages and there is something in the range for everyone. Let me know what you think of them when you try them.